And that’s me back from what used to be known as Screen Academy Wales, but is now called Media Academy Wales — am I the only person who thinks that sounds considerably less cool? This was probably my last storylining workshop of 2011, for BA and MA students in film, video, and games from several Welsh colleges. As ever, I began by ranting at them about odd ideas, rules and techniques in the animation business. As ever, the students didn’t disappoint, pitching two series ideas that they were forced to wrench into existence in less than two hours. In Chronokids, modern day children develop the ability to travel in time, and an awareness that thieves are looting Earth from the future. Meanwhile, for Fallen Angel, another group pitched a class-aware eco-drama set in a drowned New York, where a poor little rich girl falls from one of skyscrapers that still stick out of the sea, and is adopted by kindly mutant fish-folk engaged in a war against toxic dumping. These pitches join other great ideas like Choc Shock, Hattie Bast: Mummy’s Girl, Decontaminators and Waxing Moon, all of which have been whipped up out of nothing by students on previous workshops. I’m not saying it’s easy, but sometimes the students seem surprised by how their own brainstorming can create something that can give real TV shows a run for their money. And that’s the idea of the storylining workshop: simply to give people the confidence to know that they should never be afraid of a blank piece of paper, or indeed of saying a dumb idea. As ever, the “dumb” ideas turned out to be the ones that made it to centre stage. What was different about this session was that some of the students suggested that they might even take one of the ideas and develop it further as part of their course work. Well, why the hell not? If something comes of it somewhere down the line, that would be a Saturday morning in Cardiff well-spent. The venue was the swish multimedia Atrium building of the University of Glamorgan; the task, distilling a series of contradictory directives into an idea that would displease everybody equally. After initial instruction in the way that Japanese animation is put together, the students, largely postgraduates studying Film or Scriptwriting (but also Animation and Business Management), were forced to come up with their own ideas for a story bible mixing criteria from Japan, America and Europe. And within half an hour, we were arguing the merits of High School Knights versus Hattie Bast, a British schoolgirl who is also a reincarnated Egyptian cat goddess, as well as debates on tokenism, individuation, transforming robots, the merchandising value of magic amulets, and why it’s never a good idea to name your toy line after a natural disaster. There was even time out for a brief lesson in forensic pathology, as we discussed the alleged Death Note Murders. Also, there was free coffee. My favourite idea of recent classes remains Decontaminators, the series pitch worked up by students at the Irish Film Institute last week, which was concocted as a sci-fi franchise designed to sell soap to anime fans, but there’s no telling where the wild tangents and industry related rants will take any given group of participants. It’s a calculatedly hit-and-miss affair, and we’re obliged to compress debates that take weeks in the professional world into just a single morning. The recurring theme is “monoculture” – that deadly affliction of cliche to which so many TV serials and toy lines are dragged by the demands of their corporate sponsors and management teams. But surviving such pressures and getting the job done is really what the workshop is all about. I always have a lot of fun doing it and the students seemed to enjoy themselves, too. One of them called it a “wake-up call”… that’s a good thing, right…? 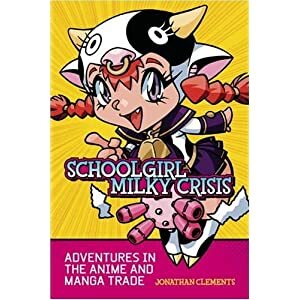 One day, I really must just give them a title like, I don’t know, Schoolgirl Milky Crisis, and see what ideas they come up with to fit it.